Born into a military family, Danni has lived all across the United States and Europe. No matter where she lived, it was in the dance studio where Danni truly felt at home. At age 16, Danni became represented by Xcel Talent Agency, soon followed by booking her first professional job dancing for country music recording artists, Luke Bryan and Big & Rich at the 2011 CMT Music Awards. In 2014, Heverin graduated with her bachelor's degree in dance and business from the University of Alabama. Eleven days after graduating, Danni landed a coveted role as a Radio City Rockette and is currently in her 5th season with the company. 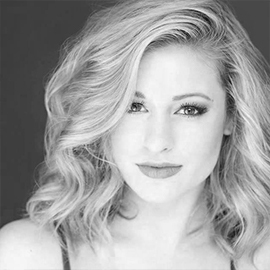 In her off season from the Rockettes, Danni travels back and forth between New York City and the metro Atlanta area, where she continues to work in the commercial film and television industry. Alongside her impressive performance resume, Danni is a dance teacher and choreographer. Teaching is one of the most rewarding experiences for Danni and she is excited to continue leading others on the journey to becoming their absolute best selves.